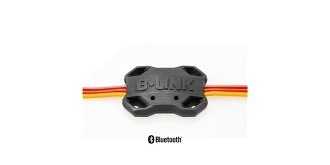 The Castle B•LINK™ BLUETOOTH® ADAPTER enables users to wirelessly program settings and update firmware on current Castle Creations ESCs, many older models and the BEC 2.0/BEC Pro on Apple iOS devices. With the waterproof Castle B•LINK Bluetooth adapter and Castle Link™ mobile app, users can quickly alter ESC parameters and fine-tune adjustments anytime, anywhere. COMPACT AND LIGHTWEIGHT at 7.25” x 0.81" x 0.27” (184.15mm x 20.57mm x 6.85mm) and .23oz (6.62g), it can be installed in the vehicle/airframe without significantly increasing model weight. CONVENIENT WATERPROOF DESIGN means B•LINK can withstand all weather conditions and allows users to quickly adjust settings in the field without disconnecting or disassembling the model. FREE CASTLE LINK™ APP DOWNLOAD is available on the Apple App Store for use with iPhones and iPads (estimated release 4/26/18 or sooner). Once downloaded, it does not require a data connection and can be used anywhere including remote areas. EASY TO USE APPLICATION can be used with multiple B•LINK Bluetooth adapters or can store model information and allow users to use one adapter on multiple models as well as sync information between multiple iOS devices. PASSCODE PROTECTION is enabled on B•LINK Bluetooth adapters. A 4-digit passcode is used to prevent tampering with settings. CASTLE LINK FOR ANDROID will be released at a future date, with the B•LINK Bluetooth adapter compatible with both versions.